It’s Saturday night, and after a long perilous journey into the bowls of Ikea (where Kei and I smote the Minotaur, collected our handmade paper lamps, our steel shower caddies and fought the throngs of similarly budget minded nesters (Edward Norton eat you heart out)) we are at the Connecticut Yankee enjoying an enormous fried chicken and prime rib dinner while Kei rides out the final days of the football season watching the Indiana San Diego game. The pub is quite homey. The walls are covered with old time sports celebrities (Joe Montana is striking a prayer pose to my right) and Otis Redding Plays on the stereo. I have a feeling we will return here before the season is over. Kei and I walked down to a local japanese homestyle restaurant down the street last week. Its called Kitchen Kura and its just like sitting down to grandma’s kitchen (except my Grandma was from Nebraska, not Nagoya). The food was very delicious, authentic, and reasonably priced. The restaurant has about 5 tables, and lots of hand printed signs around telling you what’s fresh that day. Kei had a fish that was broiled in sake dreg sauce (kasuzuke), buttery and so delicate and yummy. I have a feeling we will be coming back to this little neighborhood gem before we move to Mission Bay. It’s Football Sunday and since Kei wanted to catch the final quarter of the Packer game at the local sports bar I was tasked with grabbing the pizza. I stopped in at the lil’ Italian restaurant pie shop Milanos. They made the pizza right in front of me in less than 20 minutes. It was a pepperoni pizza, not too greasy, and not too thin or thick of a crust, a sauce with the right amount of seasoning. Heaven in a dish. This little Sunset neighborhood has almost everything we need. I’m happy to be the recipient of the newest designer accessory from Paris, cat. Not only is it one of a kind, the essential haute coteur accesory of the season, but it doubles as a neck warmer. Here is Kei celebrating Obama victory. 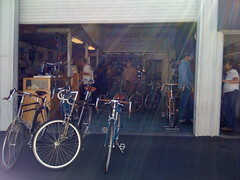 Kei and I took a trip up to visit the wool wearing chaps at the Rivendell Bicycle works in Walnut Creek. We enjoyed testing out the A Homer Hilsons, the Altanti and the (soon to be defunct) Ramboulliet. The folks were very friendly and not pushy. I got measured for a bike, as did Kei. They measure you on a stump with horsehoes where you put your feet, and then you pull up this stick to your crotch attached to some measuring tape. I ended up coming away with a Noodle bar, some new brake hoods and some TekPro interrupters for the Mercian. Kei is now thinking about the joys of a proper bike. 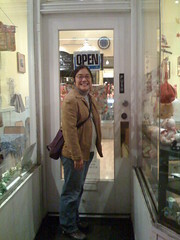 Kei and I participated in the San Francisco MP3 experiment, thanks to her lab friend Mike. I donned my red Gang Of Four Entertainment T Shirt and headed out with my ipod queued to the MP3 voice of Steve. Here is a description of the event. It was a good study in crowd dynamics (Swarming, if you will). We played some exciting activities like “attacker” and “defender” with random primary color clad strangers. We also did Human Tetris, twister and had an “Epic Battle”. That was a good study in crowd dynamics. On the Y axis you have the level of interest. On the X axis you have the time (marked by event (umbrellas opening, epic battle, etc.). Notice how the interest level goes up until the Umbrellas go up. Then they go down as the event appears to be obviously a performance art piece. Not the zombification of lots of primary clad impressionable internet enabled folk. I just finished a book “The War of Art” by Steven Pressfield. The subtitle says it all: Break Through the Blocks and Win Your Inner Creative Battles. What I like about the book is that it seems like you are reading his bedside journal. 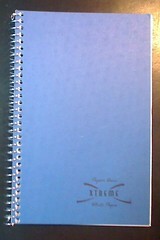 Each chapter is a page or two where he describes the subtle techniques used by resistance, which you can think of as procrastination, screwtape, or any number of things that keep you from starting that excercise routine, writing your novel, starting your new business or any other creative endeavor that God put him on this earth to do. The central notion is one I’ve heard before, but cannot hear enough: What you fear most doing is what you need to do. In this case, for him it was writing the screenplay for “The Legend of Bagger Vance”, a novel about golf of all things, that was made into a motion picture. This fear is like a pointer to the true north of what you really need to do, but may be avoiding for a number of reasons. The second notion that was powerful was the distinction between the professional and the amateur. Where the amateur has an avocation, and might stake his self worth on the performance of that thing, and therefore have an idealized view of his potential greatness, the professional has a vocation, and does not stake his self worth or ego on the performance of that thing be it writing a play, performing a play, or writing a poem. He clocks in at 9am, puts in 5 hours, clocks out and gets on with his life. The distinction is subtle but important, for when you become a professional you stop worrying as much about the possible perfection you could do, and recognize that important thing is the reality of the doing, warts and all. I had dinner with a business colleague and her partner the other day. Her partner (Doug) was someone who just finished his first novel. He said he split up the novel by looking at the target words for the book (in this case 80,000), his target date (in this case 3 months from today) and figured out how many words he needed (1000 a day) to hit his target. He had a full time job. Each evening, after dinner he would force himself to write 1000 words a day. He said it wasn’t easy to do at first, but he got in the habit of sitting down, writing and putting in the time. The interesting thing was that he told me was that in the last week, he took a full week off of work. This was the most difficult part of the whole 3 months, because he had a 12 hours a day to agonize over his 1000 words a day, rather than 3 to churn out his 1000 words. There is a lesson here, and it is part of Parkinson’s law which states that a task expands to the time given to do it. Doug mentioned that if he would have had 4 months to do the novel, it wouldn’t have resulted in any better quality or productivity, he would have just stretched out the task to fill that amount of time. Now obviously, there is a breaking point. You couldn’t write the Brothers Karamazov in 24 hours. But nevertheless, the principle generally applies to creative endeavors. When I was in San Francisco, I was walking over to the local grocery store. They don’t have chain grocery stores in San Francisco. Kei and I were cooking dinner late on a Saturday night, so we went out of our way to find an open convenience/grocery story. On our way, we passed by a normal looking house with a wire gate. Kei said, “Hey Ed, there’s Craigslist HQ.” I turned and looked for the distant skyscraper, towering on the horizon. Not seeing one, I looked back at Kei quizically. She pointed at the house beside me. There beside me, in simple Courier New was the sign of Craiglist.org. It was refreshing to look at something that has become as core to everyday life as Google but has remained small, simple and true to its roots. Come to think of it, it makes sense that the non-profit community bulletin board site would keep to its humble beginnings. In this world of IPO and rampant conquest, this was a refreshing site. Either that, or San Francisco real estate is more profligate than I worst stories I had heard!